The Internet is full of websites that are phishing for your private information or contain malicious code that can jeopardize the security of your PC. 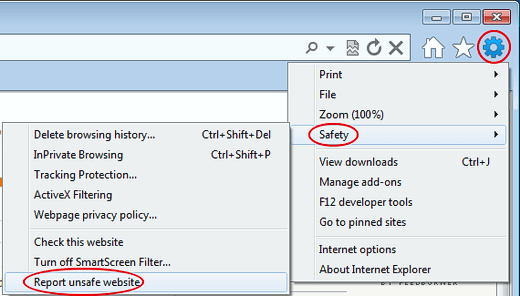 Using a safety feature built in to IE9, you can inform Microsoft when you think you’ve found an unsafe website. 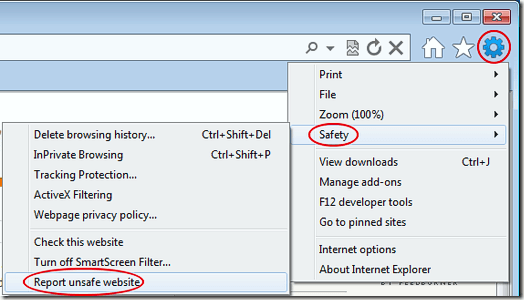 Learn how to report unsafe websites to Microsoft in Internet Explorer 9. Why Report Unsafe Websites to Microsoft? Although a number of active and passive safety devices are available to keep your PC secure, nothing is more powerful in keeping everyone’s PC safe than active participation by a community of computers users. Recently, Microsoft began harnessing the power IE end-users to help report websites that appear unsafe. There are two major threats when it comes to websites. The first threat is a phishing scam that attempts to get visitors to reveal personal information. This information often forms the basis for identity theft and other crimes. The second threat is malicious code that executes on your PC and introduces viruses and other malware to your computer. If you think you’ve encountered either threat, you can inform Microsoft. The company then adds the website to its growing database of suspicious sites. When it gets enough complaints about a website, the site is flagged as a potential security threat. When other users attempt to access the site, they are warned that the site may be a threat to personal or PC safety. By reporting suspicious websites, you are doing your part to make the Internet safer for everyone. 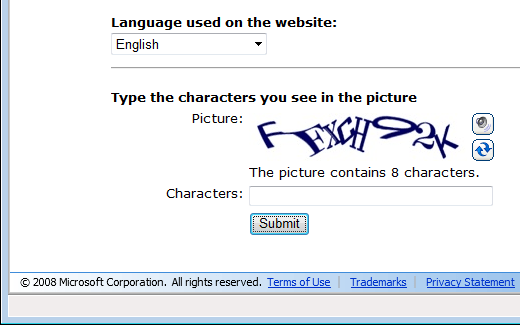 If you suspect that a website you are currently viewing in Internet Explorer 9 is a phishing scam or contains malicious code, click on the Tools button in the upper right hand corner of the application. When the menu opens, click on Safety>Report Unsafe Website. 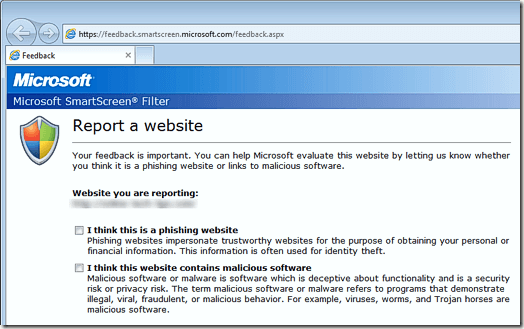 Internet Explorer 9 opened up a Feedback window on which you can report the unsafe website. This feedback window is a part of IE9’s SmartScreen Filter technology. It is this filter that helps users of the browser use the Internet more safely. Note that the screen shows the Website You are Reporting and asks you to choose which type of threat you think the website poses. Read carefully the descriptions for reporting either a phishing scam or a malicious code website. If you are unsure, choose either one; Microsoft will give it the same priority. 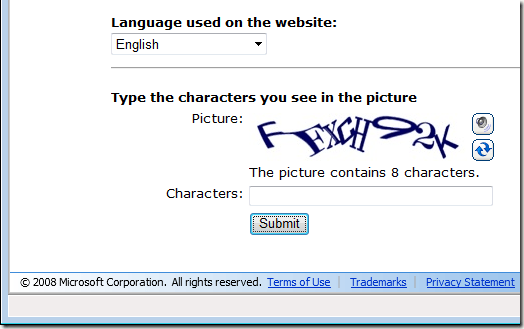 Choose the Language Used on the Website and type in the characters you see in the figure. Click the Submit button and you are done. It is a good idea to close Internet Explorer 9 now so you are less likely to be affected by the unsafe website you just reported. Serious security risks arise when websites are nothing more than phishing scams or contain malicious code that can introduce a virus or other malware onto your PC. 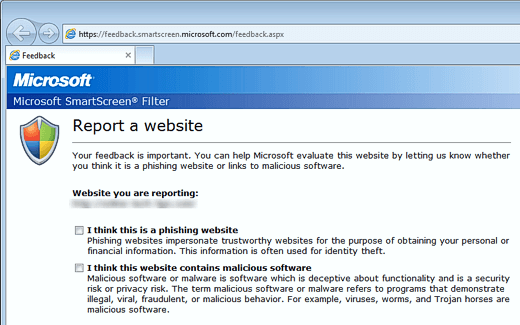 Using the Report Unsafe Website feature in IE9 – a part of the SmartScreen Filter technology – you can report the unsafe website to Microsoft. If the company receives enough complaints, other users are warned when trying to view the website. In this way, the community takes an active role in making the Web a safer place to surf.